An aerial view of pockets of dead or dying trees, as seen within the Lake Tahoe Basin on the West Shore. Source: U.S. Forest Service Aerial Survey. *Figures are estimates, and are as of the end of 2015. Visit tahoe.livingwithfire.info to learn all sorts of tips and information about Sierra trees and how to live in a fire-prone area. TRUCKEE, Calif. — Twenty-eight million. That’s the estimated number of trees in California that were dead or dying in 2015 as a result of the ongoing drought, according to the U.S. Department of Agriculture. The 28 million figure is not only a record-high for the state, it’s roughly 10 times more dead trees than were recorded in 2014 — just one year prior — by the U.S. Forest Service Aerial Survey team. In other words, California’s tree mortality is rising at a historic rate and showing no signs of slowing down. 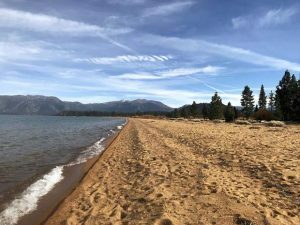 According to the U.S. Forest Service, Forest Health Monitoring Program, Region 5, there was an estimated 35,038 dead or dying trees within the Lake Tahoe Basin in both Nevada and California by the end of 2015, with 11,215 acres affected by mortality. Meanwhile, the Tahoe National Forest — which extends east of Sacramento, through the foothills and across the Sierra crest to the California state line — showed roughly 93,167 dead or dying trees and 33,266 acres of mortality. 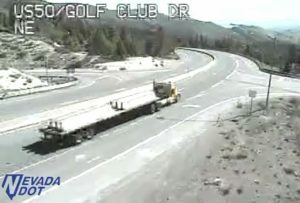 Indeed, the drought has led to millions of California and Sierra Nevada trees deprived of water. This, Mustatia said, results in swaths of trees that become stressed, consequently losing their ability to fight off the attacks of bark beetles. “The trees need water to survive, but also to protect themselves from insects that bore into the tree and create galleries where they lay their eggs,” said Mustatia, who went on to explain the breakdown of a tree’s defense system. “The trees use the water to create a pitch to push the beetles out of the tree. And if they don’t have the water, they can’t use that mechanism to keep the beetles from attacking. At Lake Tahoe, the Jeffrey pine beetle — described by USFS as the primary insect pest of the pine trees — is the most prevalent, Mustatia said. But they are not the only borers on the North Shore. Additionally, Ips engraver beetles infest red and white fir trees in the region, she said. In fact, in some areas of the state, primarily Southern California, the beetles are adapting to the warmer climates and subsequently having more than one life cycle, Mustatia said. “You’re basically looking at double the insects,” she said. 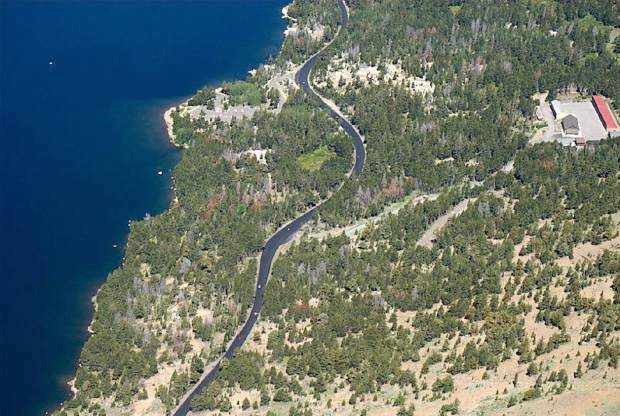 For Lake Tahoe, the bark beetle epidemic, thus far, is minimal compared to other pockets of the state, said Jeff Dowling, the North Tahoe Basin forester with Calfire. “We haven’t yet seen a significant increase in the amount of mortality driven by the drought on the east slope of the Sierra,” said Downing. So what can be done to help save our drought-stricken trees? Dowling, who has worked for Calfire for over 30 years, points to a method that may seem counterproductive to the general public: tree thinning. “Here, locally, where we’ve aggressively gone out and thinned spans (of trees), we are not seeing mortality in the numbers we might see had we not aggressively thinned,” Dowling said. Essentially, too many trees on too few acres creates a logjam, if you will, in the forests. This results in suffocated trees fighting for moisture, sunlight, and nutrients — especially during this unprecedented drought. Tree thinning, meanwhile, helps alleviate the trees’ fight for survival, agreed Mustatia. 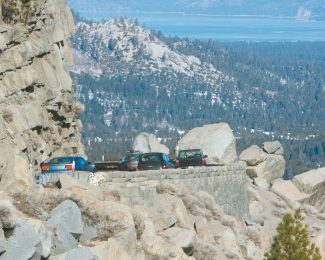 “I attribute some of the healthier forests in Lake Tahoe to eliminating so much of the competition,” she said. “You’re creating a healthier forest. The trees that we left on the ground have more water available to them. Another method used to help maintain a healthier forest is prescribed fire, said Forest Schafer, who is, fittingly, a forester with the Incline Village-based North Lake Tahoe Fire Protection District. Quite simply, fire removes dead accumulations as well as young trees that are not as fire-adaptive. With fewer trees to compete for water, the ones left can grow strong and be less susceptible to fires and more capable of pitching out bark beetles. For instance, Dowling said, on the east side of the Sierra at lower elevation, more frequent fires would stamp out the small trees in the brush and give the large trees — the pines — more space for sustainability. The truth of the matter is, Seline said, during the drought the trees are so dry that as soon as the snow melts, forests in the region and state will begin to experience midsummer fire behavior. 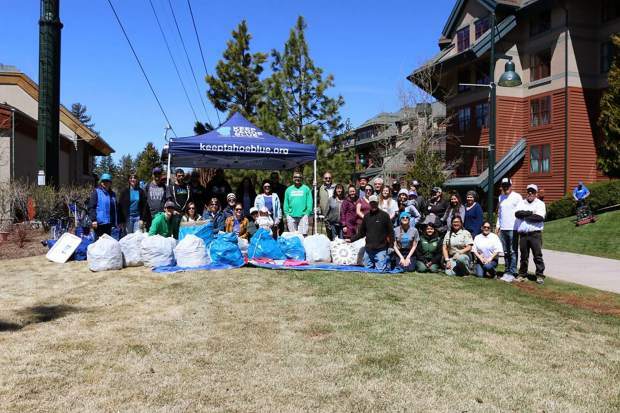 For property owners of Truckee-Tahoe, Seline said the most important thing to do is create and manage defensible spaces. Notably, a law enacted in 2005 requires defensible space clearance — in other words, decreasing the amount of fuels — around homes and structures to remain at 100 feet. “We realize that it takes a lot of work and diligence for property owners to manage that,” he said. “But, it’s not if a fire will start in Truckee, it’s when — is your house defensible? With that in mind, Dowling said homeowners should routinely keep a sharp eye on the health of their trees, especially when the Tahoe fire season heats up this summer. “If they start to see a tree’s not looking as green as they did, they need to pay close attention to whether or not they’re seeing pitch running out of the trees,” Dowling said. “If the tree does indeed die, they need to get it cut as soon as they possibly can. Because the longer you let the tree sit there, the opportunity for the insects to escape and move to another tree increase.